While we’re all aware of cool technology like HDBaseT for moving AV signals around over the network, there's a new kid in town. From a little known hotbed of innovation close to my heart, a Canadian based company has developed a chipset that is poised to shake up the AV distribution world. Rather than just attempt to make another version of something else already out there in the wild, AptoVision has found a way to completely change the premise of network based switching. 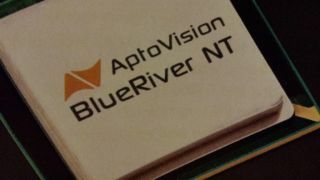 AptoVision has found a way to completely change the premise of network based switching. By removing the traditional captive switch technology and utilizing off the shelf 10GB ethernet switches, AptoVision is able to send all its data via packets. Since the data stream is packets, the BlueRiver NT chip is able to ensure that they can pass uncompressed 4K video and 32 channels of audio over fibre or copper cat cable, all while staying on the same network. Once integrated into a manufacture’s TX/RX box, the chipset will allow any configuration of the sources and displays with a zero latency or time sync issues. Due to the packet nature they strip out the genlock clock out os the data stream and then reinsert it across the board to ensure a perfect sync. They are also able to send multiple streams to one display, creating a virtual video wall with just the chip and control software, without the need for a traditional AV switcher or multi viewer appliance. Claiming a 50%+ reduction in costs due to the architecture using off-the-shelf 10GB switches, this chipset seems poised to make a lot of noise in the digital transport stream!